There has been much in the news in the last year about the impact that stoves have on air pollution (most specifically particulates), and the proposed changes that are going to be implemented to tackle this. Regrettably there has been a great deal of inaccurate reporting so the document below lays out what the situation is at present (January 2019). Air pollution is a big issue in the UK, especially in cities and there are currently targets in place to reduce the harm to human health from air pollution by half by 2030. Much has been done to tackle the emissions from transportation and industry in the last 20 years and now the the spotlight is being turned on smaller sources of pollution including domestic heating. As seen above, burning wood and coal in homes makes up 38% of the UK’s primary emissions of fine particulate matter. This statistic is including open fires burning house coal, which are hugely polluting, as well as much older, inefficient stoves and more modern stoves. Not all forms of domestic burning are equally polluting. It depends upon what you are burning, how you are burning it, what you are burning it in and how well maintained the appliance is. The Government’s draft Clean Air Strategy (published January 2019) lays out the next steps. The document only applies to England as air quality is a devolved matter, but as stove manufacturers will need to comply with the proposed regulations this will affect the choices that we have in Scotland. It is expected that the Scottish Government will follow suit. These proposals are not retrospective, so if you already have a stove installed you will not be forced to remove or upgrade it. What are stove manufacturers doing? The Stove Industry Alliance (SIA) and manufacturers have been heavily involved in the proposals and have a certification system in place already to ensure you can buy stoves knowing that they will meet the new requirements coming in 2022. These SIA Ecodesign Ready stoves are already available from a number of leading manufacturers, including those that we stock. What can I do to reduce my emissions? If you have an open fire: consider replacing it with a modern stove, preferably an Ecodesign Ready stove. If this is not possible, ensure you are burning dry wood or a smoke-free solid fuel. 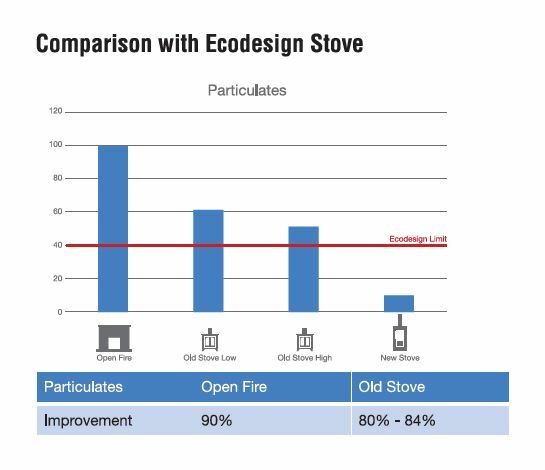 If you have an old stove: consider replacing it with a modern stove, preferably an Ecodesign Ready one. If this is not possible ensure you are burning dry wood or a smoke-free solid fuel if your stove is multi-fuel. Also make sure you are getting the chimney swept and are maintaining the stove regularly. Leaking door seals can be an issue. If you already have an efficient stove: ensure you are burning dry wood or a smoke-free solid fuel if your stove is multi-fuel. Also make sure you are getting the chimney swept and are maintaining the stove regularly. Check that you are burning your fuel efficiently using a stove top thermometer. Why is dry wood so important? Burning wet wood results in poor quality combustion, increased smoke and the production of tars and creosotes that will damage the flue. Much of the energy of the wood is being wasted boiling off the water in it, rather than heating your room. This means that even an efficient stove will not be operating at its full potential. Sourcing dry wood can be difficult, and it is worth checking your supplies. Although the outside may appear dry it is worth splitting a log and measuring the moisture inside using a moisture meter. You are looking for a reading of 20% or less. This applies to wood you have seasoned yourself as well as that you have bought in. The proposed changes are not going to stop householders from sourcing and seasoning their own wood. An alternative fuel is wood briquettes which are available locally. They tend to have a moisture level of only 7% and can be burnt alongside wood. A government backed scheme called Woodsure has been created to certify wood as being dry enough for sale, but this is unlikely to be prominent in this area for some time. What solid fuel can I burn? You should only burn solid fuel that is recommended by your stove manufacturer and is HETAS approved. Therefore, you should not be burning house coal in a stove and any other fuels should be checked before purchase. One result of the proposed changes has been a significant reduction in the number of water heating stoves available on the market. As the firebox is surrounded by the cold water in the boilers they tend to burn at a lower temperature and are therefore less efficient than a dry stove. Some manufacturers are not putting these stoves forward for the expensive process of certification as it is not economically viable for them to do so, meaning that they are no longer available to buy. There are still a few very good boiler stoves available but there is much less choice than there was.